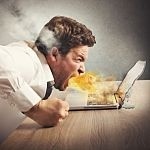 Here at TheHappyMD.com we support overstressed and burned out doctors and physician leaders every day. We have a large internet presence with a busy website (20,000 hits a month) and lots of followers on LinkedIn, Twitter and Facebook. And we are constantly sharing tools and support to help physicians be healthier and happier. One of the constants of being a sympathetic voice on behalf of physicians on the internet ... is the snark, vitriol, and downright evil trolling of the doctor haters. You may not be aware of this but there are a LOT of people who hate physicians with a near homicidal passion flying around the internet 24/7. One of the places they love to leave hostile messages is on any "prevent physician burnout" article or blog post. We have a training video on how to deal with an angry or upset patient called the Universal Upset Patient Protocol - it has over 60,000 views on YouTube. AND it has a comment box which I moderate before a comment is visible to the site visitor - thank god. "I wish more doctors committed suicide." Really? You really wish that ... like, for real? I used to go after these people -- you know, responding back to them with an equal but opposite emotional reaction ... but that quickly turns out to be a lose:lose situation. So now I leave their comments up - unless it is really evil and personal. I don't have do anything to help them stand out. Or i write a furious response and delete it in an attempt to somehow wash their ick off me before I move on with my day. 1) Those who have been traumatized by a bad outcome for themselves or a family member and blame that doctor. That trauma has somehow generalized into loathing for all doctors. I am so sorry for whatever happened to these people that now has them trolling the internet looking for doctors to hate. And unfortunately doctors are the people who try to help in situations where people are trying to die - and remember no one gets out of this life alive. Our patient interactions are often a very high-stakes, emotionally charged encounters and bad things happen regularly and predictably. 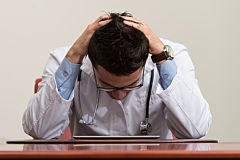 In my experience, many doctors are similarly traumatized by the very same mistakes, bad patient outcomes and malpractice suits ... no one comes out unscathed on either side of the event. 2) People who hate "rich doctors" in general -- seeing physicians as a privileged class, part of "the 1%" and not worthy of empathy under any circumstances. In either case, I sincerely hope the word vomit that I read in their rants bears no resemblance to the quality of their relationship with their personal physician. When they are knee to knee with their doctor in the exam room, I am pretty sure they aren't saying this stuff to the doctor's face. I just wish they didn't say so much of it online. I will just keep writing my righteously indignant replies ... in the privacy of this desktop computer ... and deleting them. And if doctor haters are getting you down ... just remember this quasi-latin phrase. Roughly translated it means "don't let the bastards grind you down"
What is your experience with doctor haters and what do you do when they aim their anger at you?